As mentioned in a brief posting in last November, Logos is now working on digitalizing and making available with their Logos Bible Software, Logos 5, several of the volumes of The Loeb Classical Edition. So far- from info gathered on their website – it looks like the folks at Logos.com are working on too many of the volumes to list them all here. But you might have a closer look by checking out these pages. Some of the works are still gathering interest, while others are underdevelopment. Philo of Alexandria, see here. Pliny’s Natural History, see here. 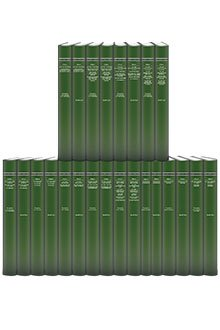 Some of the Loeb sets are also already available for downloading, like e.g., Clement of Alexandria, Homers Iliad and Odyssey, Select works of Virgil, and some more. Scholars who have dealt with the so-called classical Greek and/or Latin texts from Antiquity will know The Loeb Classical Library; the small green volumes containing Greek texts and the read ones containing Latin texts are well-known and dear to most scholars in the fields concerned here. And those interested in Philo will most probably have used the Colson/Whitaker edition of Philo’s texts contained in 10 +2 small green volumes. It has been said that the volumes were made small so they could fit into a scholar’s pocket; now you can soon have not only one but all the volumes in your pocket, because the The Loeb Classsical Library is getting to be digitalized! They do not tell you, alas, what the price will be, and if there will different packages containing various sets of volumes, or if you have to buy volume by volume. Nevertheless, this is a major achievement, and surely something to be welcomed. The Stavanger International Conference on Disability, Illness and Religion 7-9 May 2014 aims to promote discussions within the fields of theology and religious studies that focus on illness and disability. The program for the conference is now set and we believe the conference will offer an exciting opportunity to address and discuss a wide range of issues from many perspectives. We are honored to have several keynote speakers who will address disability, illness and religion issues from various points of view. We have also received many abstracts within a wide variety of fields. In order to register for the conference, click here. To see the brochure for the conference, click here. Almost about 4 years ago, I had a posting discussing the future of Hebrew in theological curriculums; see Exit learning Hebrew?. I did not draw any firm conclusions, just presenting some pro and contra arguments. Now we have a group of at least three fabulous Bible Software programs (Accordance, Bibleworks and Logos Bible Software), that should make us rethink not only how we teach the Biblical languages, but also what such programs might represent to our present students, and perhaps not at least what help they can offer when our students go out and start working in the parishes. “I think about . . . working with biblical languages. What difference should it make to the way we prepare Christian leaders for working with biblical texts that we now have shelves full of commentaries that work with Greek and Hebrew, numerous lexical aids on which to draw, and Bible software on our computers? What difference does it make that I can access many of those tools from web-supported devices that I can wear on my belt and carry into an adult education class or into the local coffee shop? In the last couple of decades, the world of biblical study has been revolutionized. Should we continue to use slide rules? Will we allow graphing calculators? Should the way we prepare students for working with Scripture change on account of the increasing availability of tools that do so much of the heavy lifting for us? When entering the office of a pastor or teacher, I invariably survey the books. And I find myself looking for the placement of this pastor’s Greek New Testament, her copy of the Greek-English lexicon, and maybe even the companion Hebrew Bible and Hebrew-English lexicon. Most of the time, those books are present and accounted for, but they are across the room from her desk, and are older editions, versions of those texts current when she was in seminary. It is hard not to conclude that work in the original languages, required in seminary, has not been her constant companion since graduation. Can we prepare students for working with Scripture in the original languages in ways that actually make a difference long-term? Might the increased availability of language-based tools assist us in this work? It is true, of course, that some of our students and graduates want and need advanced expertise in the biblical languages. Fuller Seminary has been and wants continually to be a school whose graduates contribute to biblical and theological scholarship at the highest level. Advanced work with the biblical languages for such people is simply a prerequisite, and Fuller Seminary will continue to provide language instruction that serves the church in this way. I quote this with approval, but I have a certain feeling, that we are just at the beginning of exploring what Biblical Software might represent for both our curriculums, our teaching and learning,- and for our students and their future work as pastors. I have been working as an editor (and writer of 3 chapters) on a volume to be published as “Why Read Philo? And How? A Handbook to Philo of Alexandria.” The manuscript was submitted ca a year ago, and now I finally saw it listed in the publisher’s web catalogue: you can see it here: Eerdmans. The volume is said to be published in August this year. Several scholars have been engaged in writing some very interesting, relevant and valuable introductory chapters on Why and How study Philo: Per Jarle Bekken, Peder Borgen and me from Norway, Erkki Koskenniemi and Karl-Gustav Sandelin from Finland, Ellen Birnbaum, Adele Reinhartz and Gregory E. Sterling from the USA, and David T. Runia, now in Australia. I will present the volume and its contents more fully in a later posting.